1. To peel and seed tomatoes, remove core and then cut a small cross in the skin at the other end of the tomato. Then plunge into boiling water for 30 or so seconds until the skin loosens. Immediately, remove the tomatoes from the boiling water and put into ice water to stop the cooking. When the tomatoes are cold, remove the skin with the help of a paring knife. Then cut in half by not cutting through the core. Squeeze the tomatoes to remove seeds. 2. In a large saut� pan over moderate heat, saut� the onions in 3 Tablespoons of olive oil for 4 minutes. 3. Add the green and red peppers and cook until they and the onions are soft (about 10 minutes). 5. Add tomato, thyme, bay leaf, salt, and hot Hungarian paprika. Cook until the tomatoes soften and most of the moisture has evaporated (about 20 minutes). 6. In another saut� pan over moderate heat, saut� the eggs in remaining 2 Tablespoons olive oil. Season them with salt and hot Hungarian paprika. Cook them as you wish (sunny side, over easy, over hard, etc.). 7. 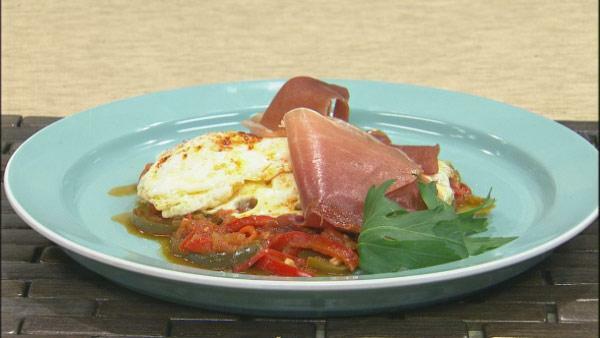 To serve, place some piperade on individual plates. Top each plate with 2 eggs and then some sliced prosciutto.